First, we are closely interlinked with the wider Berghof network of organisations that are working for peace and conflict research, peace practice and peace education as well as funding of related endeavours: Berghof Foundation of Conflict Studies, Berghof Conflict Research, Berghof Peace Support, all in Berlin, Germany and the Institute for Peace Pedagogy (Institut für Friedenserziehung) in Tuebingen, Germany. - through contributions to the project "Reflecting on Peace Practice", run by CDA Collaborative Learning Projects in the USA (see www.cdainc.com/cdawww/project_profile.php?pid=RPP&pname=Reflecting Peace Practice). 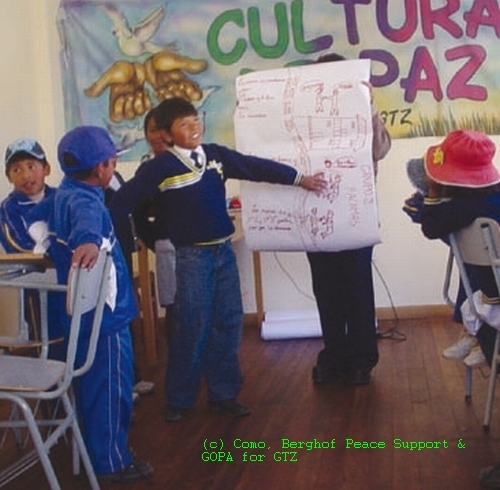 A very concrete and explicit engagement of BPS for Culture of Peace is carried out in the framework of a GTZ (German Technical Cooperation) programme in Bolivia, where a team is supporting the development of curricula for both schools and teacher training for implementing a Culture of Peace. The mandate derives from article 10 of Bolivia´s new constitution, the practice builds on a process initiated since 2007, when teams of teachers and the regional government in two regions of Bolivia started implementing activities for a Culture of Peace and consequently have started to develop a proposal for a curriculum to ensure formal integration into the education system. The advice and consulting activities of the Bolivia team - in which BPS is responsible for thematic guidance - include several activities in Culture of Peace. There, we aim to help build the societal bases for dealing constructively with conflicts in a diverse and deeply divided society. Schools and authorities in two regions have elaborated education material and modules on education for peace and curricula that mainstream peace education in primary and secondary schools. Currently, the programme supports curricula for the formation of teachers and provides material to the Ministry of Education to support their efforts in implementing the new constitution’s mandate to enhance Peace Culture in Bolivian society. Firstly, we have been running / are running a number of action research-inspired projects. Two shall be mentioned here: (a) support for youth initiatives and civil society in Bosnia-Herzegovina; (b) research into the evolution and transition from war to politics of so-called non-state armed groups. (a) The Berghof Research Center has supported youth initiatives in Bosnia-Herzegovina since 1999. In particular, Berghof staff developed a special programme for youth with the German Development Agency, GTZ, that was funded by the German Foreign Ministry between 2000 and 2003. Among the many initiatives included in this programme, the Tuzla-based NGO IPAK ("nevertheless") has been outstanding in its efforts to combine peace work and development work with young refugees from the Drina region. Consequently, the Berghof Research Center encouraged IPAK to develop a project in Eastern Bosnia that could contribute to peaceful integration of returnees in rural areas of Republika Srpska, where massive destruction, human rights violations and expulsions occurred during the war. The resulting project, Young People Build the Future, was set up in Krizevici (near Zvornik) in 2002, with support from the German NGO Schüler Helfen Leben. The project was conceived by young people who had been involved with IPAK's activities since the 1990s. It combined development and peacebuilding instruments that offer incentives for inter-ethnic cooperation through networking, education, vocational training and income generation. A youth centre, craft shops for wood production and greenhouses have been established in 2003, bringing together Bosniak returnees and youth from the local (Bosnian Serb) population. Project activities include: training and preparing for income generation by setting up a youth cooperative; international youth exchange; education; training in civil conflict management and democracy-building; and psychosocial support (i.e., trauma work and drug prevention). The aim of this project is two-fold: 1) to contribute to local community building; and 2) to have a conflict-defusing and preventive effect. IPAK strives to develop the potential of young people for social innovation and reconciliation and, at the same time, to help them avoid developing destructive potentials. Young people in the area who have no education or employment opportunities, for example, are highly susceptible to the influences of shadow economies and/or criminal structures. Crucially, they also can be easily recruited by nationalist and violent movements. Another important purpose of the project is to address a trend that has been evident in Bosnia-Herzegovina for many years: to reduce the migration of youth to foreign countries, which results in the loss of vital resources for social development. At Berghof, we have supported IPAK through regular evaluations and feedback workshops that enhance opportunities for self reflection between 2004 and 2008. (b) Berghof's research into the transition of groups from war to politics builds on a network of groups who have experienced the transition from armed resistance in violent conflict to political engagement in post-war state-building. Its current overall goal is to carry out focused analysis and participatory action research on security-related transition processes, by critically reassessing international approaches to security and political negotiations, demobilization, civilian reintegration, military or police integration, and the transformation of national security architectures from the point of view of resistance and liberation movements. A previous first phase of this action research project, running from 2006 to 2009, aimed to gather, analyse and make available to others the experience of political groups which emerge within violent struggles and have variously combined military and political strategies both to engage in a conflict transformation process and to acquire political power in post-war societies. It did so (a) by building a network of people representing such experience, who engage in information-exchange and peer-advice; and (b) by disseminating the results of that engagement in the form of both academic analysis and policy advice. The first project-phase has been managed by the Berghof Research Center and the Berghof Peace Support (BFPS) in Berlin, Germany, in co-operation with the Institute for Justice and Reconciliation (IJR) in Cape Town, South Africa. Secondly, we would like to mention the work in dialogue and peace process faciliation that the Berghof institutions have been doing over the past decade (supported, needless to say, by numerous partners). Again, we would like to present two projects to illustrate this kind of work: (a) Georgian-Abkhazian-South Ossetian dialogue workshops; (b) the work of the Berghof office in Sri Lanka. a) As part of our long engagement with the region, we are currently working with young leaders and open-minded young professionals in Georgia, Abkhazia and South-Ossetia. We and our project partners believe that it is crucial to broaden the space for dialogue through “people-to-people” contact. Through joint workshops and study visits we aim at deepening their understanding of the political processes in the communities affected by conflict and at building their capacities to think about complex solution models to the challenges their societies face. Since 2009, we are conducting the project “Engagement through Dialogue: Dialogue and Study Visits for the Transformation of the Georgian-Abkhazian & Georgian-Ossetian Conflicts” in partnership with IKV Pax Christi from Amsterdam (NL) and local partners in Georgia, Abkhazia and South-Ossetia. Our engagement looks back on a long history though, as the first of these types of workshop was held - still in cooperation with the UK-based organisation Conciliation Resources - in 1997 and has been running throughout the past decade. b) Our engagement with Sri Lanka dates back to the year 2001 when we started providing capacity-building for conflict transformation and dialogue opportunities to the main stakeholders of the conflict through the Resource Network for Conflict Studies and Transformation (2001-2008). While meanwhile the LTTE has been defeated militarily in 2009, we continue to firmly believe that the conflict still needs to be solved politically. The primary objective of the RNCST hence was to enhance domestic capacities for conflict transformation in Sri Lanka. In particular, this included supporting and complementing already-existing Sri Lankan organizations in problem-solving, dialogue, training and research. It also meant enabling interested partners to make the best use of the state-of-the-art in conflict transformation. The project aimed to engage with all stakeholders in a constructive, empathetic and multipartial manner based on transparency and a partner orientation. •	Consultation and engagement with key individuals at the official diplomatic or peacemaking level, as well as with their advisors and other influential people around them. Thirdly, we want to mention Berghof Conflict Research's flagship publication project, the Berghof Handbook for Conflict Transformation, which celebrated its 10th anniversary in 2009. This publication and internet platform presents cutting-edge knowledge and experience for scholars and practitioners working on transforming violent ethnopolitical conflict. •	including a wide range of voices and perspectives from different regions throughout the world, as well as from multiple disciplines and faculties. The Berghof Handbook is published in English, but selected articles also have been translated into seven other languages, including: Spanish, Turkish, French, Arabic, Russian, Sinhala and Tamil in order to reach out to many people around the world. Of particular relevance for the Culture of Peace and Nonviolence for the Children of the World among the articles published and themes covered is Veronique Dudouet's contribution on Nonviolent Resistance and Conflict Transformation in Power Asymmetries from 2008 (see www.berghof-handbook.net/documents/publications/dudouet_handbook.pdf), as well as several contributions on peace education and training. Finally, through ongoing research on conflict transformation processes in general and on the potential of systemic thinking in particular, we aim to enhance our understanding and repertoire in addressing violent conflict and transforming it into constructive conflict. In this context, Systemic Conflict Transformation (SCT) represents a collation of best practice in conflict transformation work and systemic models of social relations. It draws on methodologies from other disciplines, such as family therapy and psychotherapy, change management and organisational theory, and cybernetics. Our colleagues from BPS in particular have, over the past years, developed conceptual and practice-related contributions for strengthening systemic thinking in peacebuilding. In our work for Bolivia, the integration of Culture of Peace in the constitution, as well as concrete experiences and material for classroom and societal activities mark good progress, as they are opening up opportunities to put the topic onto the agenda of ministerial, provincial and local education practice. More generally, over fifty armed conflicts that are currently being waged around the globe might well give reason to draw a sad picture. But researchers (see especially Human Security Report Project, Simon Fraser University, Canada) have outlined that the past 15 years have witnessed a general and substantial decline in armed conflicts, including the number of armed conflicts, battle-related deaths and genocides. Their data base shows that both state and nonstate (intra-state) wars have decreased in number during the 1990s, and in particular between 2002-2005 (from 66 in 2002 to 56 in 2005). Some have argued that the most compelling explanation for this decline is found in the upsurge of peacemaking and peacebuilding activities that started in the early 1990s, by the UN, but also supported by many other international agencies, donors, governments and NGOs. Of course, these trends are no reason for complacency or self-congratulations, as many of the drivers for warfare and deadly assaults against civilians – from poverty to group inequality – go on unabated. Definitely, the world is still far from having effective institutions and instruments that guarantee stable peace. But at the same time, the progress that has been made should be fully acknowledged: among that progress is the development of a wealth of instruments and methods of addressing conflict nonviolently; the institutionalisation of conflict prevention and conflict transformation in many universities, organisations and policies (for the latter, see for example the German action plan for "civilian conflict prevention, conflict resolution and post-conflict peace-building" at http://www.auswaertiges-amt.de/diplo/de/Aussenpolitik/Themen/Krisenpraevention/Downloads/Aktionsplan-En.pdf) ; the increasing attention paid to methods and approaches of practitioners from the Global South; etc. Parts of this progress the Berghof organisations have been supporting, and they have also benefited from the space that has been opened for peacebuilding and nonviolence. One lesson from our work in Bolivia is that engagement in Culture of Peace in the education system requires long-term engagement and channels into political agenda setting. While our team covers both the Culture of Peace activities in the education system and also advises ministries on conflict management and transformation, for other actors it seems to be either-or, which may limit the progress of the field as a whole, where education and political culture should be seen as interdependent. Again more generally, we observe as an impediment the trend to simply "add" civilian capacities of constructive conflict management and nonviolence to exsísting, extensive and ever more expensive military crisis intervention mechanisms and capacities. Often, debates are situated in strong and limited risk and security scenarios which can be counter-productive to profound conflict transformation and peacebuilding (seen, for example, in the effects of "terrorist listings" which exclude important actors from peace talks). Also, there is still too little coherent strategising and implementation for nonviolent action and peacebuilding among actors. Furthermore there rarely is conscious debate and planning for long-term policies and programmes, as well as conflict prevention activities, as opposed to short-term crisis intervention so that structural causes of violent conflicts may remain unaddressed and virulent. - to forge an alliance between conflict&peace and education experts to build the basis for dealing constructively with conflicts and diversity. By follow-up events on the decade of Culture of Peace by secular and religious, regional and global organisations; an increase in public outreach of nonviolent movements through campaigns, information and activities; and an intensification of dialogue with political decision-makers.